It was revealed through numerous sources last night that the Phillies and Texas Rangers have agreed to a trade sending lefty ace Cole Hamels and lefty reliever Jake Diekman from Philly to Texas. In exchange, the Phils will receive lefty Matt Harrison and a quintet of prospects: catcher Jorge Alfaro, outfielder Nick Williams, and pitchers Jake Thompson, Alec Asher, and Jerad Eickhoff. It marks the 2nd straight day that the Phillies completed a major trade involving a heavily rumored pitcher, following Tuesday's swap of closer Jonathan Papelbon to the Washington Nationals. Nobody was more tuned in to this developing deal over the last couple of days than Jim Salisbury. The Comcast SportsNet insider has taken to Twitter a handful of times since the lefty finished off his historic final-start no-hitter on Saturday with revealing information, and he was first on the story yesterday. For the franchise, another chapter closes in the book which I frequently have come to refer to as the "Glory Era", covering that period of consistently winning Phillies baseball from 2001-2012 which included just a single losing season, and that one at just 80-81 in 2002. Hamels was the Phillies 1st round selection at the 17th overall pick in the 2002 MLB Amateur Draft out of Rancho Bernardino High School in his native San Diego, California. In a minor league career that lasted just 39 starts over parts of 4 seasons, Hamels went 14-4, allowing just 117 hits in 201 innings with a strong 276/74 K:BB ratio. He was first called to the big leagues in May of 2006, making his first start at Great America Ball Park in Cincinnati. While he did not gain the official Win on that night, he was strong. Over five innings, Hamels allowed just one hit while striking out seven Reds. He did show some first-start jitters, however, walking five batters. In the starting lineup that day were a half-dozen players with whom Hamels would forge a strong bond, and with whom he would win a ton of baseball games over the ensuing years: Jimmy Rollins, Chase Utley, Pat Burrell, Ryan Howard, Shane Victorino, and Carlos Ruiz. He gained his first official big league Win on June 6th of 2006 at Chase Field in Arizona, as the Phillies drubbed the DBacks 10-1. Hamels went 5.2 innings that evening, allowing just three hits. Overall he would go 9-8 across 23 starts as a rookie, allowing 117 hits over 132.1 innings with a 145/48 K:BB ratio. That exciting freshman performance was the beginning of his career, and brought him into the tremendous nucleus that the club was forming. That nucleus would win the next five consecutive National League East crowns, would win back-to-back NL Pennants in 2008 and 2009, and would most importantly win the 2008 World Series. In that 2008 World Series run, Hamels was named the Most Valuable Player of both the National League Championship Series and the World Series. He went 4-0 in that postseason, possibly missing out on a record-tying 5th victory only due to the rain deluge that turned Game 6 of the World Series into a historic four-day long epic saga clincher. Overall in parts of 10 seasons with the Phillies, Hamels accumulated a 114-90 record with a 3.30 ERA and 1.145 WHIP across 295 games, 294 of those as a member of the starting rotation. In his 1930 innings pitched, Hamels allowed 1717 hits with an 1844/492 K:BB ratio. In 2011, the final winning season of that "Glory Year" period, Hamels was part of the "Four Aces" rotation along with Roy Halladay, Cliff Lee, and Roy Oswalt. The group was largely responsible for a record-setting 102 regular season Phillies victories. As his slightly older "Glory Era" teammates aged around him, some were traded off and found success elsewhere, such as Victorino, who won a World Series with Boston, Burrell, who won a World Series with San Francisco, and Jayson Werth, who remains with a contender in Washington. Most of the others either have retired, such as Halladay, Oswalt, Jamie Moyer, and Brett Myers, or are dealing with the twilight of their careers with declining results or injuries, including Lee and the only three remaining 2008 champions: Howard, Utley, and Ruiz. In Texas, Hamels joins a team that is just four games out of the 2nd AL Wildcard playoff position, but that would have to jump over a half-dozen other teams to ultimately earn that postseason spot. They trail the first place Houston Astros by eight games in the AL West race. It is rumored that the Astros were the other finalist for Hamels services, and the Phillies brain trust may have actually preferred the package of prospects that Houston was offering. However, Houston was also not on Hamels list of nine teams to whom he would accept a trade per his contract, and it is rumored that he turned down a request to go to the Astros. If the Rangers don't make a run to the postseason this year, they still have what they wanted in Hamels. Outside of Coors Field in Colorado, Texas is probably the 2nd best hitters park in Major League Baseball. It is extremely hard to lure a big name free agent to the club. Hamels was willing to accept a trade there, and is now under team control for the next 3-4 seasons as well at a fair market value. Texas has righty ace Yu Darvish currently on the disabled list after he underwent Tommy John surgery back in the spring. The supremely talented Darvish should return sometime around next May or June, giving the Rangers a strong 1-2, lefty-righty combo atop their rotation for the next few years. This is an emotional moment for Phillies fans, the 2nd one that we have had to deal with in recent months, following the winter trade of iconic shortstop and franchise all-time Hits leader Rollins to Los Angeles. There will be more to come in the months ahead as Howard, Ruiz, and Utley also leave, one way or another. On Sunday, September 7th of last season, with none of us having any clue that it was taking place, Hamels took the mound in what history reveals was a goodbye of sorts to that "Glory Era" club. In a 3-2 loss at Nationals Park in Washington, D.C. on that Sunday afternoon, Hamels went 6.1 innings and took the loss. Rollins and Ruiz were in the starting lineup with him. Howard and Utley would make pinch-hitting appearances. It would be the final time that what has to be considered as the "Core Five" of that club would appear in a game together in a Phillies uniform. As a side note, Werth was in the Nats lineup that day. Hamels not only has been a tremendous performer on the field, but through his and wife Heidi's charitable efforts with 'The Hamels Foundation', he has been a contributing member of the local and broader community, and a positive example for young fans and other players to emulate. It's an emotional time for me personally, as it is for most of you reading this piece. I clearly remember the day that Hamels was being called up to make his first career start. It frankly doesn't seem that long ago, and yet it has now been over nine years since that May day in 2006. He and the group of players that came through the system with him, and those who came to the team during those late-00's seasons, provided so much entertainment, so many joyful memories, so much great baseball to a town that was starved for that kind of sustained performance from our Fightin' Phils. No doubt, we will have opportunities to cheer them again. Not only in person when some actually return during their playing careers as opponents, but also in future reunions of the great 2008 championship team, and the memorable 2011 record-setting team as well. I look forward to each of those opportunities to thank and pay tribute to performers who gave us all so many wonderful moments and memories. Twice in my lifetime, I have been blessed to enjoy such a sustained run by Phillies teams. The other time being as a teen and young man during the mid-70's through early-80's period which also yielded a World Series victory. I feel blessed to have enjoyed both runs fully. I think we all hope to enjoy another at some point in the not-too-distant future. This trade has been rumored, discussed, and anticipated for months. No doubt it will be dissected numerous times in the coming days, months, and years. But it is done, and the franchise continues to look towards the future more and more. Jonathan Papelgon to D.C.? Now That's Natitude! The Phillies have completed the long awaited and much speculated trade of flamboyant but efficient closer Jonathan Papelbon, sending him to the division-rival Washington Nationals. Washington already had Drew Storen pitching as an extremely effective closer, so this move was somewhat of a surprise when it began to first surface in recent days. Storen turns 28 years old in two weeks, and was a Nats 1st round pick at 10th overall in the same 2009 MLB Draft in which they selected pitcher Stephen Strasburg with the 1st overall pick. So far this season, Storen has 29 Saves and a miniscule 1.73 ERA and 1.018 WHIP. In 36.1 innings he has a 44/9 K:BB ratio and has allowed 28 hits. Those are first-division closer numbers, and are very similar to those put up so far by Papelbon, when you factor in the difference in the two teams. Papelbon has also been outstanding with the Phillies. The 34-year old went 17-17 in Save chances while getting limited opportunities closing out games for the worst team in baseball. He has a 1.59 ERA and 0.983 WHIP, allowing 31 hits in 39.2 innings with a 40/8 K:BB ratio. Papelbon's option for 2016 was picked up and guaranteed by Washington after being renegotiated from the $13 million that he would have earned under it's original terms to $11 million. In return, Papelbon received assurances that he would assume the closer role, rather than Storen. The Nationals are receiving one of the game's great closers of the last decade. Papelbon is the all-time franchise Saves leader with both the Boston Red Sox and the Phillies. He has a combined 341 career regular season Saves, with a 2.32 ERA and 1.019 WHIP over 11 seasons. In 667 innings, he has allowed 513 hits, with a 761/167 K:BB ratio over his career. Papelbon has also gained a reputation, somewhat undeserved, as a troublemaker. However, those on the inside of both teams say that Paps was in fact a good teammate and locker room presence. Most of his trouble has come due to his inability to filter public commentaries, which when they are actually evaluated for content reveal themselves to be nothing more than brutal honesty. Looking for someone who won't wilt in the pennant race and under the glare of October baseball, Papelbon is the perfect fit for the contending Nats. He has tossed 27 career postseason innings in 18 appearances, allowing just 14 hits with a 23/8 K:BB ratio and 7 Saves, including the final out of the 2007 Red Sox victory to clinch the World Series. In return, the Phillies will receive 22-year old righthander Nick Pivetta, who entered the season as the 10th-ranked overall prospect by Baseball America in what was considered an above average Nationals minor league system. So far this season, Pivetta has gone 7-6 with a 3.02 ERA and 1.253 WHIP across two minor league levels in that Washington system. He has a 78/38 K:BB ratio while allowing 89 hits in 101.1 innings pitched. The big 6'5, 220 lb righthander was selected by the Nats in the 4th round of the 2013 MLB Draft out of New Mexico Junior College. He is a native of Victoria, British Columbia in Canada, and starred for the Canadian Junior National Team in both 2008 and 2009. Pivetta now joins a stable of young potential starting pitchers in their low-20's whom the Phils have acquired via trade for their veterans. Previously both Tom Windle and Zach Eflin arrived from the Dodgers for Jimmy Rollins, and Ben Lively from the Reds for Marlon Byrd. The Phillies continue to listen to offers for ace lefty Cole Hamels, and it was reported today that they gave interested clubs through Wednesday to submit final offers. It would appear that they will then sift through those, possibly make a couple of final call backs on Thursday to try and play teams off one another, and then make a final decision on whether any offer on the table is worth pulling the trigger. Any number of other Phillies players could also move, if the price is right. Those include outfielders Ben Revere, Domonic Brown, Jeff Francoeur, and Darin Ruf, 1st baseman Ryan Howard, DL'd 2nd baseman Chase Utley, catcher Carlos Ruiz, and pitchers such as Jerome Williams and the soon-to-return Aaron Harang. The likelihood is that most of those players will still be here past the deadline, and that the team will then try to get them all through waivers. At that point, the players would be able to be traded right through the balance of the season. Trades have finally begun to finalize, fast and furious, in Major League Baseball. The deadline for non-waiver deals comes at 4pm EDT on Friday afternoon. Will Cole Hamels be dealt before that time? Only time will tell. MLB Trade Deadline: Who Needs Ryan Howard? Wait, am I seriously going to suggest that as this year's MLB trade deadline approaches, some team could actually use Ryan Howard? At least, enough that they would actually give the Phillies anything of any value in return for him? That is exactly what I am going to suggest. Of course, with a player like Howard, and a contract like his, your potential trade partners and the piece that you will get in return is going to be limited. But none of that means that he can't be dealt. Let's start out by looking, as we have throughout this series, at exactly what an acquiring team would be getting in Howard. Born in Saint Louis, Ryan Howard was the Phillies 5th round selection in the 2001 MLB Amateur Draft out of Missouri State University. He immediately set about destroying minor league pitching at every level. Across 4+ seasons rising incrementally through the Phils system, Howard hit 110 homeruns. He was clearly ready for the big leagues in the 2004 season when he destroyed AA & AAA pitching to the tune of a .291/.380/.637 slash line with 46 homers and 131 RBI. The problem? The Phillies were moving into new Citizens Bank Park, and still had Big Jim Thome as their 1st baseman. So Howard languished, and even had to begin 2005 back in the minors, where he banged out another 16 homers and 54 RBI while hitting .371 across in just 257 plate appearances. When Thome's season was ended early due to injury at the end of June in '05, Howard finally got his chance to become the Phillies starter. In just 88 games he slammed 22 homers, drove in 63 runs, hit .288 and was named the National League Rookie of the Year. The following season, Howard upped his game, hitting for a .313/.425/.659 slash line. He slammed a franchise-record 58 homers and knocked in 149 runs, leading the National League in both categories. For the monster season, Howard was named the NL's 2006 Most Valuable Player. That kicked off the tremendous run, both individually and for the team. Howard would smash 47, 48, and 45 homers over the next three seasons with RBI totals of 136, 146 and 141 from ages 27-29, becoming the league's preeminent power hitter. Led by 'The Big Piece' in the middle of their batting order, the Phils won the NL East for the first time in 14 years in 2007, then won the World Series in 2008. In 2009, the Phils returned to the World Series, and Howard was the NLCS Most Valuable Player. As he entered his 30's, he slowed up some. In 2010, he missed some time due to injury, but still finished with 31 homers and 108 RBI. In 2011, healthy again, Howard banged 33 homers and drove in 116 runs. But it was in the 2011 National League Divisional Series where the party ended, both individually and for the team. The Saint Louis Cardinals defeated the Phils in a dramatic 5th game to win the series 3-2. And on that decisive game's final play, Howard blew out his Achilles tendon. We all know the story since. He struggled to return from the injury at the same time that he was aging into his mid-30's, and at the same time that the team was beginning to disintegrate due to similar age and injury issues. Howard returned to full health last year, and regained a semblance of his old power stroke, banging out 23 homers and 95 RBI. Once again, Howard is having another solid power showing this season at age 35, leading the Phillies with 18 homers and 53 RBI. 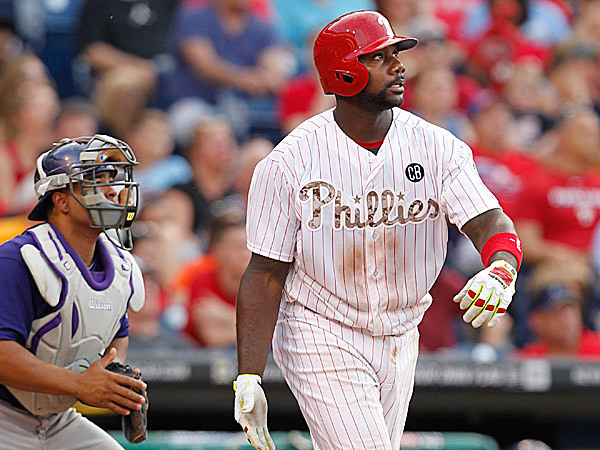 The long story short on Ryan Howard is, he still bring pop to the plate. He also strikes out a ton, hits for a low average, and is barely passable defensively as an every day 1st baseman. But there aren't many power hitters available on the market. Maybe Milwaukee's Adam Lind, or a similarly limited Mike Napoli of Boston. So with all those more recent limitations in mind, who needs Ryan Howard? Are the Rays still in this thing to win it? I mean, they're just 3.5 out in the AL Wildcard race, right there with the Blue Jays and Orioles in chasing the Twins. They start James Loney at 1st base currently, and he is hitting .254 with 3 homers and 17 RBI. Their DH is Joey Butler, with his 6 homers and 21 RBI. Those are numbers that Evan Longoria needs hitting behind him in the lineup. Howard ain't what he once was, but he's a more potent threat than either of them. The Rays cannot take on the Howard contract. But if the Phillies were willing to pay it - ALL of it - then maybe Tampa takes him and surrenders catcher Nick Ciuffo. Heck, even an injury risk former high-ceiling like pitcher Ryne Stanek might be worth a shot. The Astros have been riding high most of the year as a sudden contender. But things are tenuous, despite the acquisition of Scott Kazmir to bolster the rotation. They are going with Chris Carter, hitting .184 with 16 HR and 43 RBI at 1st base. Bringing in Howard to use as a lefty compliment to not only Carter, but also regular DH Evan Gattis? It could make sense. The Astros have a ton of prospects to deal, even at the deeper levels of their Top 20. This could be an interesting match. That's it. I mean, I could really go out on a limb, and create scenarios wherein Howard could help out in the NL Central and Wildcard battles by going to either the Cardinals or Pirates. Maybe. I could put him with the Twins, and make an argument that he upgrades over Joe Mauer, but they would never do such a thing to their civic treasure. The Mets need bats, but probably would just as soon keep trotting Lucas Duda out there, hoping for a turn around. It's really hard with contenders. If the Phillies simply want to give Ryan Howard away to some team, any team, and are willing to pay his entire contract, they likely could do so. But I think it's just as likely that either he stays, both this year and next as the Phillies 1st baseman, or stays for this year, and simply is bought out or maybe even retires in the off-season. MLB Trade Deadline: Who Needs Ben Revere? Could Cole Hamels possibly have done any more to maximize his value to the Phillies as the MLB non-waiver trade deadline approaches this coming week? Hardly. Already the subject of an earlier chapter in this "Who needs?" series, Hamels no-hitter may be the perfect punctuation mark to his career in Philly, and provide the impetus for another team to get a deal done. 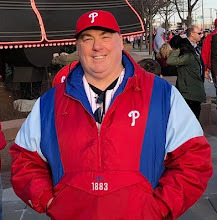 As strong as that performance was, he is not the only Phillies trade chip involved in trade rumors to step up his performance in advance of the deadline. Closer Jonathan Papelbon, who I covered in yesterday's chapter of this series, and outfielder Jeff Francoeur, the subject of the opener of the series three days ago, have both performed well of late. Another Phillies trade chip who is performing well as that deadline approaches, and who has also been rumored in trade speculations, is speedy outfielder Ben Revere. As with those earlier segments, before we get to the possible destinations for Revere, let's examine what a team would be acquiring. Born in Atlanta, Georgia, Revere was the 28th overall pick by the Minnesota Twins in the 1st round of the 2007 MLB Amateur Draft out of Lexington Catholic High School in Lexington, Kentucky. He set his current profile as a high-average, no-power outfielder with big time speed and intelligent base running skills over four seasons rising incrementally through the Twins minor league system. Revere received his first big league call-up in September of 2010, striking out in the only plate appearance of his first game on September 7th of that year in Minnesota against the Kansas City Royals. He would become a regular the following season, and was a starter in the Twins outfield in both 2011 and 2012. In December of 2012, Revere was dealt to the Phillies in exchange for a pair of pitchers, Vance Worley and Trevor May. Revere immediately became the Phils' starting center fielder, but his first season was cut short, ending on July 13th after he was injured grounding into a doubleplay to end a 5-4 loss in 11 innings to the White Sox. He came back strong for 2014, leading the National League with 184 hits. His .306 average made him the only Phillies player to break the .300 mark last season. He also stole 49 bases, most by a Phils player in over two decades. So far in 2015, Revere is hitting to a .302 batting average and a .340 on-base percentage, and he has 24 stolen bases to this point. With just three homers and 57 doubles in 2,402 career big league plate appearances, power is obviously not his game. But his career .293 batting average and 169 steals do show that he can be a spark at the top of a batting order. The now 27-year old would be just entering his prime for any acquiring team, but he will now begin to get a bit expensive. After making $4.1 million this season, Revere now becomes arbitration eligible. He will not become a free agent until after the 2017 season at the earliest. The talented Angels are in a virtual tie for first in the AL West with the suddenly aggressive Houston Astros, and are likely going to need to make a couple of moves if they want to keep pace with that emerging American League power. Whichever team falters is going to find itself in the middle of a huge 7-8 team scrum for an AL Wildcard spot. Mike Sciosicia's team has been linked to Revere recently, and he would likely become their starting left fielder and leadoff hitter. His ability to get on-base and steal bags would fit perfectly in front of Kole Calhoun, Mike Trout and Albert Pujols. The Angels don't have a strong minor league system, but Revere also wouldn't command a top prospect. This is a deal that could get done fairly easily. Welcome back, Ben Revere? The Twins early season blistering pace has cooled, and they now trail Kansas City by 6.5 in the AL Central race. But Minnesota still currently controls the 2nd AL Wildcard spot. There are at least a half-dozen teams within striking distance of them, and they will likely need to do something to stay in that postseason race through September. Revere would be a relatively inexpensive option. While they wait for top prospect Byron Buxton to recover from yet another injury, Revere would be a nice addition to the top, or bottom, of their AL lineup, and on Buxton's return would give them an enviable speed attack. Revere would be an upgrade for the AL Central front-running defending American League champions over Jarrod Dyson, who currently plays the 4th outfielder role for the Royals, is three years older, and has a very similar profile. Again, KC could put him at either the top or bottom of its AL-style batting order, and get a nice speed option that gets on-base enough to make a positive difference. Once their regular left fielder, All-Star Alex Gordon, returns from injury, he provides excellent bench and depth options to a club with World Series aspirations. Gordon's injury is a groin, and those are notoriously tricky. Another team that has been regularly linked to the Phillies in trade rumors, they will almost certainly do something prior to the deadline. Probably a couple of somethings. 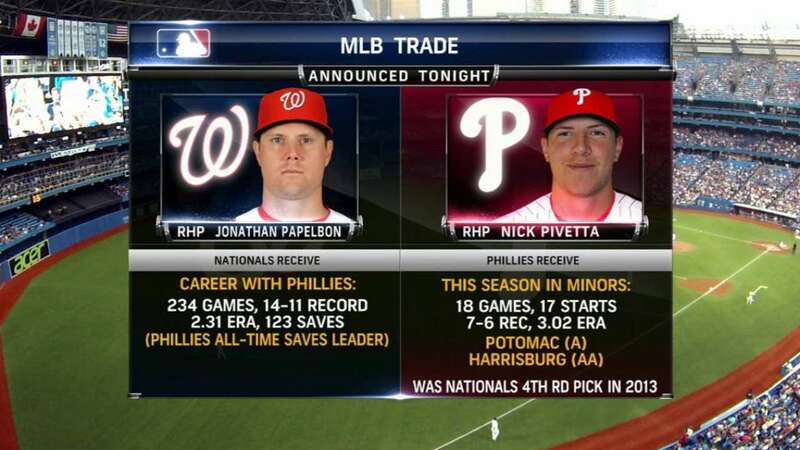 The two teams could probably swing a package deal involving Revere and Papelbon if they work at it enough. The need is there, as the Jays, just 3 games behind the Twins in the Wildcard race, absolutely have postseason aspirations. They are currently going with Danny Valencia in left, with Michael Saunders on the DL battling knee troubles. Revere would fit in their high-octane offensive lineup perfectly, allowing Valencia to return to a versatile sub role to which he is better suited. Revere has been linked to the Pirates already in a few public speculation pieces. Frankly, in my opinion, Jeff Francoeur is a better fit for the Bucs. They could platoon Frenchy with young, talented Gregory Polanco in right field. However, they could also obtain Revere, plug him into left, and move Starling Marte across the outfield. That's a bit of juggling, but Revere's on-base and speed profile would fit the top of the Pirates lineup nicely. Pittsburgh leads the NL Wildcard race, but the Giants and Cubs are both close enough that any slippage could find them on the outside looking in. Revere, or even Francoeur for that matter, could provide just the right small piece to help keep them on top. Haven't heard a thing on this one. But with Nori Aoki now on the DL with a fractured fibula, and the defending World Series champs starting Gregor Blanco in left and having Justin Maxwell as their primary outfield depth, this could be another perfect fit. The Giants hold the 2nd NL Wildcard by just 1.5 games over the Cubs in what seems like it will be a tight race to the end. It is no secret that the Mets are seeking offense. They have plenty of pitching to stay in the Wildcard race, where they currently sit 3.5 games back of the Giants. They are also just 4 games behind Washington in the NL East. They recently acquired a pair of veteran bats in Juan Uribe and Kelly Johnson, and called up top prospect bat Michael Conforto, who is now starting in left field. Revere would profile well in that spot, and at the top of their batting order, allowing both the youngster to get more seasoning, and Curtis Granderson to drop into an RBI slot. This is an intriguing match. As with many of the Phillies available players, Revere makes a nice match with many teams. He is still relatively inexpensive, and brings specific tools in his hitting and stolen base abilities that could be very valuable to a contending team in search of a top-of-the-order spark plug. He is also a positive personality, important to any clubhouse. If the Phillies can get anything of value in return, especially a young arm, he will be gone. He is also out of the lineup today, after a brief appearance as a defensive sub in the 9th inning yesterday. It is doubtful that he is injured, or the Phillies would not have put him into that Cole Hamels no-hit effort. 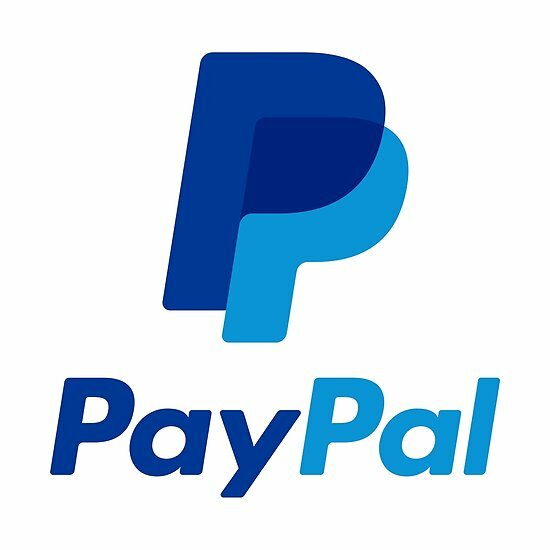 Could a deal already be in the works? MLB Trade Deadline: Who Needs Jonathan Papelbon? MLB Trade Deadline: Who Needs Cole Hamels? MLB Trade Deadline: Who Needs Jeff Francoeur?